The Urals Civil Aviation Plant (UZGA) has signed a contract with the U.S. company Bell Helicopter on assembling helicopters in Russia, which have traditionally been absent from the product-mix offered by the Russian aircraft manufacturing sector. Although similar projects have never gone beyond the discussion phase, this time, experts point out, state support in selling the helicopters could help. 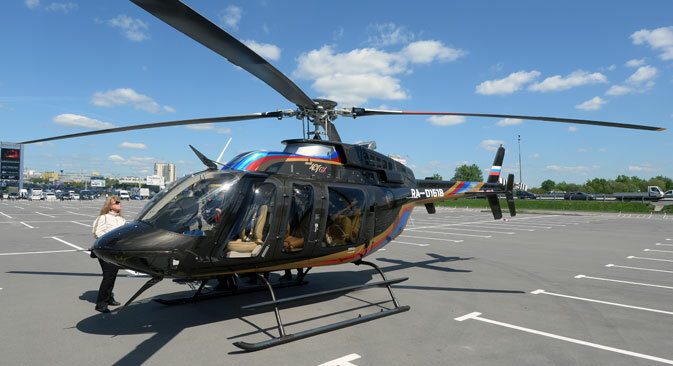 The U.S. company Bell Helicopter has signed an agreement with the Yekaterinburg-based Urals Civil Aviation Plant (UZGA) on the licensed assembly of the latest modification of its Bell 407GXP light single-engine helicopter. According to the UZGA website, the plant forms part of the Oboronprom holding company, which in turn belongs to the Rostec state corporation, one of the companies on the U.S. sanctions list. However, another Rostec entity, the United Engine Corporation, says that it owns only 48.6 percent in UZGA, with the rest belonging to private investors (mainly NK-Bank, according to the SPARK database). Badekha maintains that there is no risk that the project may end up under sanctions since “preliminary agreements with the American side” have already been secured. This is not the first time that UZGA has been engaged in the local production of foreign aircraft: In 2013, the plant began to assemble DA40 NG four-seat single-engine trainer helicopters from components received from Austria’s Diamond Aircraft. The first 49 helicopters were unveiled at the end of the year. It is planned that in 2015 UZGA will produce 60 helicopters, rising to 70 in 2016. According to the Russian Industry and Trade Ministry, in 2014 Russia produced 257 military and only 14 civilian helicopters. Vladimir Karnozov, an expert with the Aviation Explorer website, points out that Russia has already made several attempts to manufacture a light helicopter. The most progress in this area has been achieved by the Mil Designer Bureau with its Mi-34C model, so far produced only in very small quantities. In recent years, projects to assemble Airbus Helicopters’ AS350 Ecureuil light helicopters in the Leningrad Region and to jointly develop with Italy’s AgustaWestland a helicopter to be manufactured by the Helivert joint venture in the Moscow Region town of Tomilino have been considered. However, these and other attempts have never reached the implementation phase. At the moment, the Russian fleet of light helicopters is comprised of hundreds of units of various models developed by Robinson, Bell and Airbus Helicopters. According to Vladimir Karnozov, the production of Bell helicopters in Russia can become a commercial success only if there is a “state influence on the market” to ensure their distribution.